Our stay at Camperstop Afrodites ended perfectly, the owners lovely 12 year old grandson appeared at our door mid evening with a plate of freshly fried doughnuts and some dipping syrup. Ok so the site needs a little work but we care not, it you are being given free fresh doughnuts then motorhomers should be visiting in their droves. There was a note hung up in reception to say the family were having a lamb roast on March 12th and anyone staying was invited to join them – where else does that happen? A lovely family, doing a sterling job at trying to set up a good stopover – more power to them and more visitors we hope too. Our next destination was Delphi, according to Sat Nav just over 7 hours away and 203 km, obviously thinks we are both over 85 years old and drive a Lada! We took the National Road which runs parallel to the motorway to Athens, both roads were quiet so we decided against paying out the €4.60 to sit in a lane a few yards to our left. Our choice was a bit twisty and had more than it’s share of potholes, but hugging the coast and giving views out to the islands it did its job well enough for us. About 30 or so miles before Athens we headed North over the mountains, a good wide road where we saw only a handful of other vehicles in over an hour. We actually saw more goat herders than pretty much anything, at least five different ones in the space of a few miles on one mountain. The landscape changed to being a bit more scrub-land, no olives or citrus just mile after mile of views over to the next sets of mountains. At Distomo there is a powerful WWII memorial next to the main road. 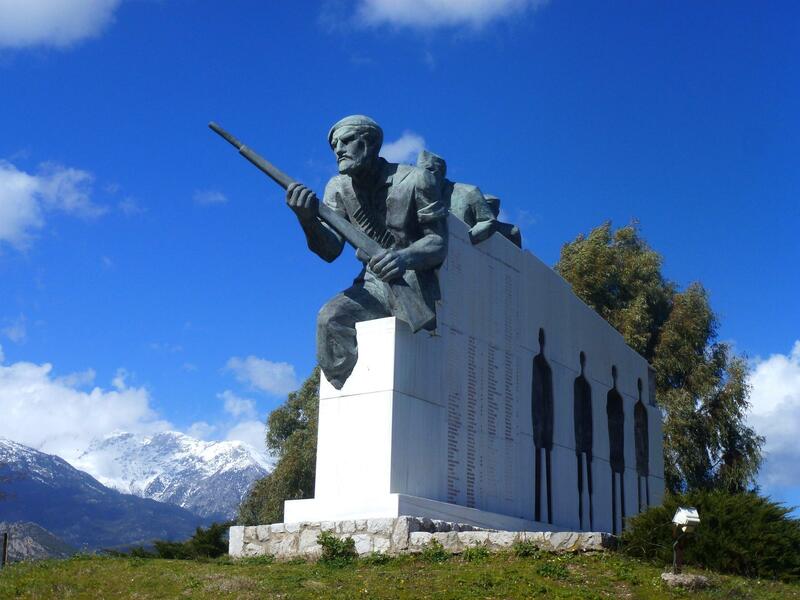 It commemorates the 1944 massacre by the SS of 214 Greek men, women and children all of whom were civilians living in the village. The first time we have seen anything relating to the war here, despite the fact Greece suffered some terrible atrocities. The ski resort of Arachova was an unexpected pleasure, worth the winding route up the mountain to just over 3000 ft, where it is perched on the edge looking as if it belongs somewhere in the Alps (that says us who have never been to the Alps). Whilst there are a lot of ski shops, ski wear and people wandering around with ski looking equipment we didn’t see anywhere near enough of the white stuff for anyone to be seriously sliding anywhere. At a glance it seems a place where its good to be seen, a bit Nafplio on snow; plenty of trendy looking shops, lovely eateries and lots of beautiful people with crazy woollen headgear. 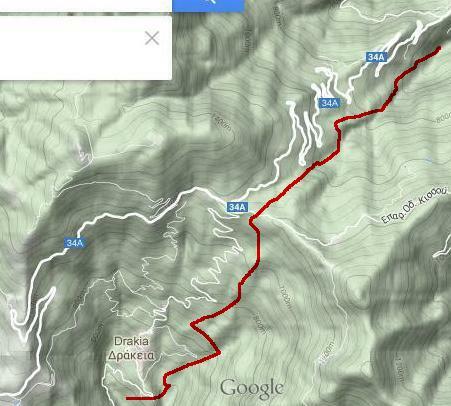 Just a few miles down the other side of the valley and we were at Delphi and our campsite, Apollon Camping. As campsites go it has a captive market in the winter, the others in the area are all closed. At €20 a night its a bit steep, especially as the ladies loos had a flood of 2 inches of water on the floor, the ceiling had started to collapse along with the light fittings and there wasn’t any hot water – all very not 5 Star. 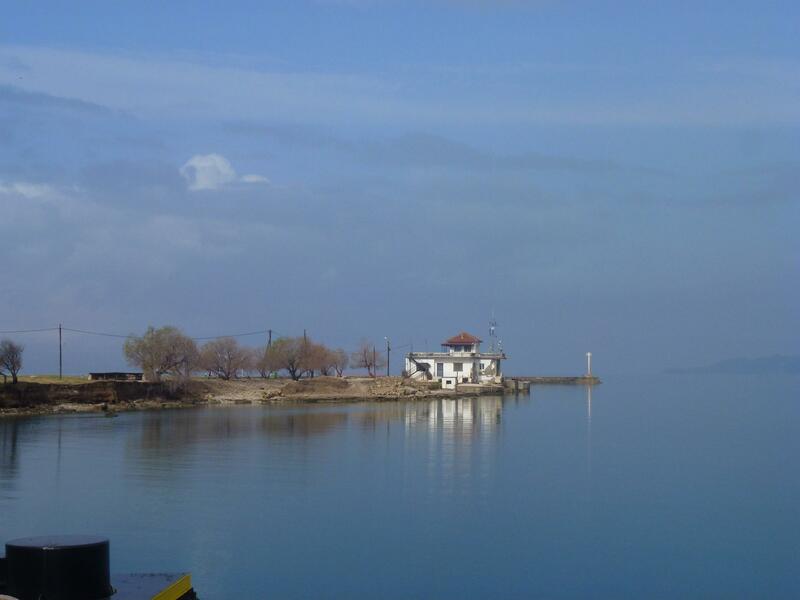 But as we looked out the front window at our view – right down to the Gulf of Corinth and over to the Peloponnese, the facilities didn’t matter so much. 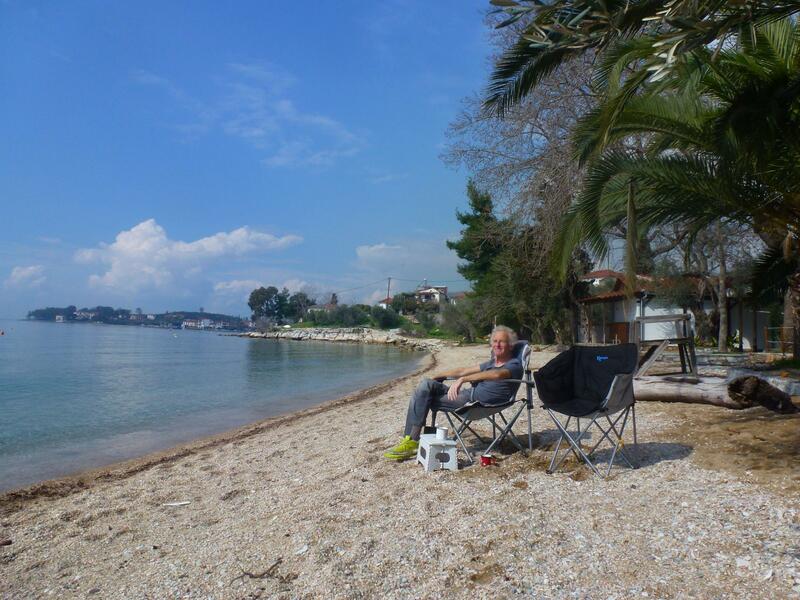 Whilst at Camping Apollon we suffered what we will from now be calling ‘dint day’. We decided at 7am to move the van from the lower level to the upper, slightly better view level before breakfast. Iain reversed off our pitch with my guidance – perfect, I climbed back in the van. We then had to reverse up behind the other pitches and oooops – we took out an electric post! How? cutting a long story short my shouting “oh watch it” without giving a bit more information meant Iain has no idea what to watch, therefore he watched something else close on his side! We now have a poorly rear bumper panel 😦 not to worry, gaffer tape cures all, should last until we are home when Paint & Trim will wave its wand and perform a no doubt faultless repair. On the upside, we now blend in much more with the locals – they all have smashed and dented panels on their cars and vans, it seems no one ever gets anything repaired. A dent here is a badge of honour and we are wearing ours proudly. Of course it could have been worse, I could have been driving! 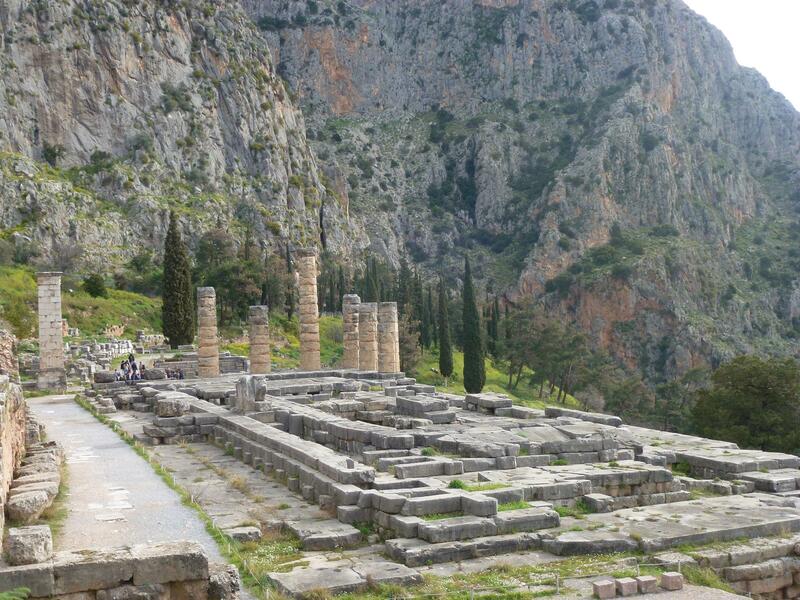 We agreed Ancient Delphi was going to be the absolutely last archaeological site for us and we are seriously thinking of a theme park next week to go to the opposite end of the holiday experience. 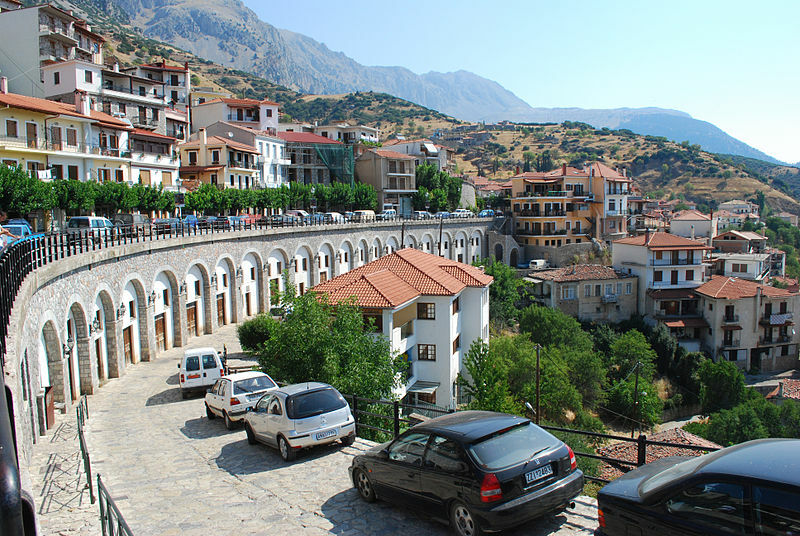 At first glance it is just another very well excavated city, climbing up the side of Mount Parnassus. What apparently makes this site so special is that it is the site of the ancient Oracle. 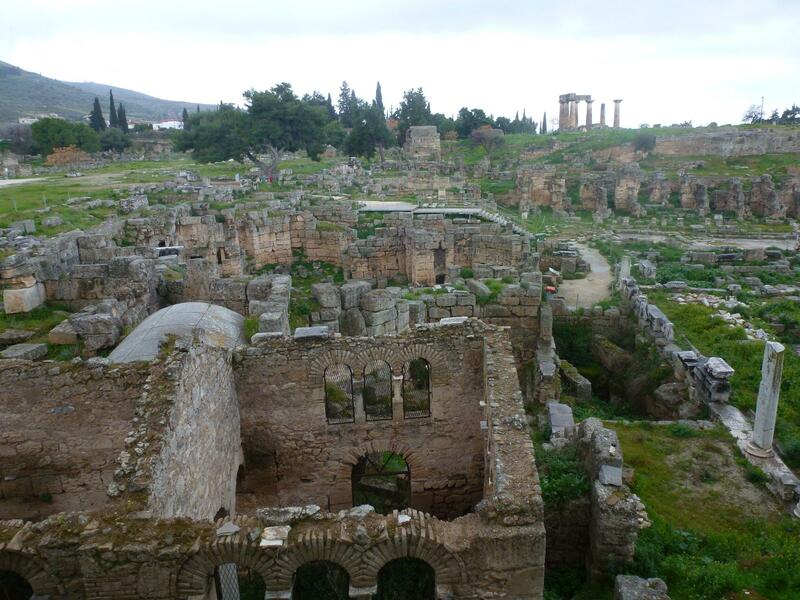 For us, and we are not real archaeological buffs, it was impressive but not as much so as Olympia or the Theatre of Epidauvrus. May have been the coach loads of tourists, of which there were several even at 9 o’clock in the morning; may have been the theatre wasn’t quite so impressive or it may have been we have seen way too many partially rebuilt temples. 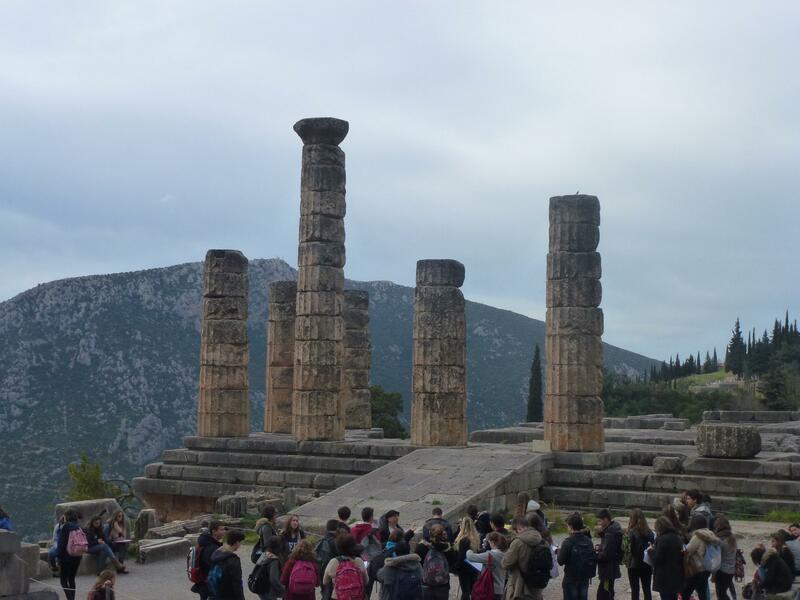 For us the views down to the coast over mile over mile after mile of olive groves, or the view up into the snow capped mountains were just as good a reason to visit Delphi as the more famous attractions. 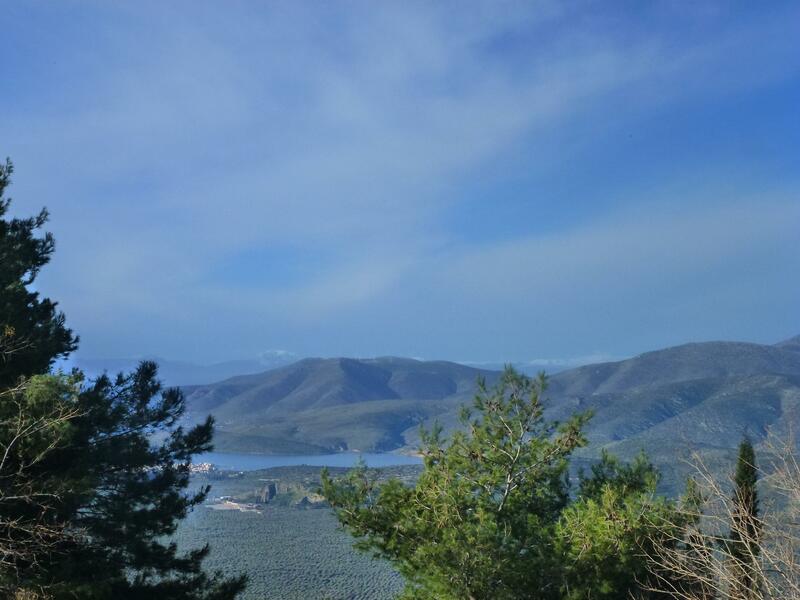 We left Delphi Friday morning heading for Camping Hellas on the coast near Volos. Heading back the way we came to the National Road, from where it should have been a good 20-30 minutes to the motorway. Time dragged a bit and I saw a sign for a town I was sure was South of us, a quick check of the atlas and yup indeedy, Sat Nav is taking us back down the National Road to join the motorway 40 odd miles South of where we could have joined. Bloody brilliant then that is an extra 80 miles (we were way to far along when I spotted it to change route and we still don’t have a proper map, just the large scale atlas). To add insult it cost us €12.50 in tolls to get back to where we had started an hour before. 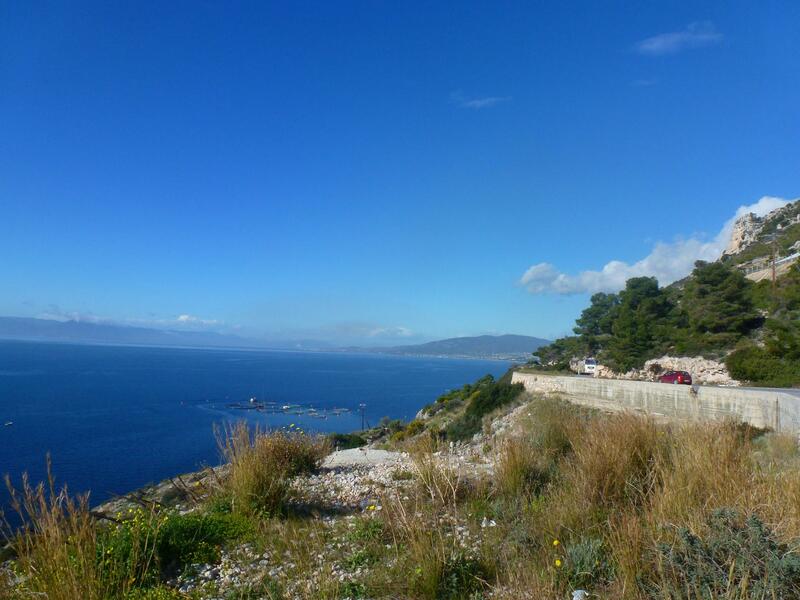 Once we arrived at Volos we negotiated the city reasonably easily (second biggest in Greece and yet the roads weren’t too chaotic) At the junction for the coast road, massive bollards – the road was shut! Words resembling ‘massive bollards’ were bandied around the van. Our options were take the Sat Nav 88km diversion or if we wanted to stay at another campsite, the nearest one 230 km in Athens. We went with the diversion, a quick check on screen showed another mountain pass coming up but Iain is taking these in his stride now. This mountain was a seriously high one at 5000 ft, Mt Pelion, amazing switch backs for miles upon miles, Greek ‘alpine’ villages and good 2 ft of snow around as we climbed over the top (although the road had been snow ploughed so was clear). It took us 3 hours to do 88 km, amazing road, shame we couldn’t see anything much for fog 😦 Did everyone seriously know Greece was this mountainous and not bother to tell us? People continually warn us not to go to Bulgaria too early due to bad weather in the mountains, how can it be any worse than here – we dread to think. We pulled in at a bakery just before the campsite (cheese pies and cakes required). Iain mentioned our long diversion, baker says “No, road isn’t closed”. Apparently the actual diversion is less than a mile back onto the coast road. If we read Greek we could have read the sign, epic fail from us, more epic from flipping Sat Nav who is in danger of being dropped off the top of the next mountain pass. Oh well, we did it, another mountain ticked off and Iain is fast becoming a candidate for Greek Mountain Motorhome Guide of the year. Yes, we know, we need a decent map and we will be buying one soon and then we will start to plan the odd journey and we know that will mean smoother trips, but possibly not as much fun. Seven hours after leaving Delphi we finally arrived at Camping Hellas, looked brilliant but not a single motor-home or caravan on site! For one awful moment we thought it was closed. Then the wonderful Antonios appears, he says they are doing work on the site for the season so not fully open, no facilities, loos, showers etc, but we can stay. We have a cheaper rate than the normal discount rate so what’s not to like. It is beautiful here, we are on the beach, literally our front wheels are less then 10 ft from the sea. We love it, it was more than worth the journey, just us, a whole campsite to ourselves and our own private beach. We are both feeling like we have just left the UK on a airplane and arrived at our holiday beach, we have been just a bit giddy and over excited 🙂 The weather forecast was for torrential rain today – wrong! its been glorious. For the rest of the week we have a scorchio forecast, 22 / 76 degrees by the middle of the week. 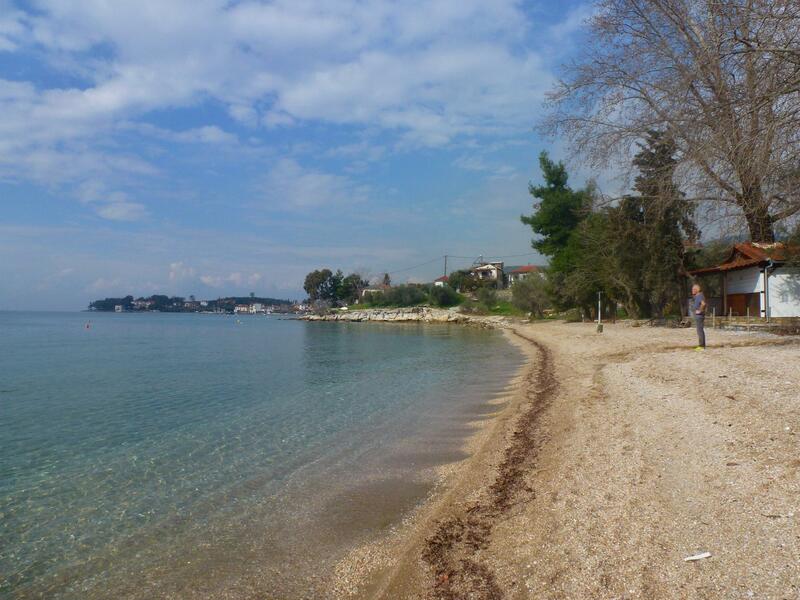 Due to good weather, our own beach and because we can, the plan has slightly changed – we are staying for a while, at least a week. We are rebelling against cultural attractions and we are going to sit on our beach, get suntans read books, cycle and walk into the village for very tasty spinach pies from the local bakery. Its a tough life but he is up to the job! If you don’t hear from us don’t worry, we are on holiday. The Grand Depart will be back on in a week or so when we can tear ourselves away. It seems we were not in Korinth (Corinth) as we thought, we were in Ancient Korinth which was 5 km away from the newer version. 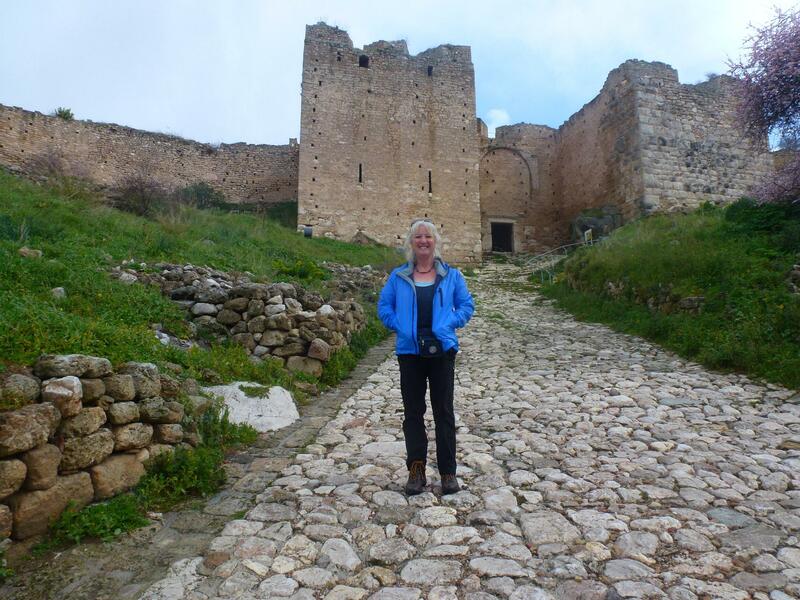 It did mean we were very close to another set of ruins and we just had to brave the rain and make the 400 metres walk into the centre of the village to the archaeological site. We agreed we would only pay the entrance fee if it looked more spectacular than anywhere else we had been, as we both felt a bit all ruined out. 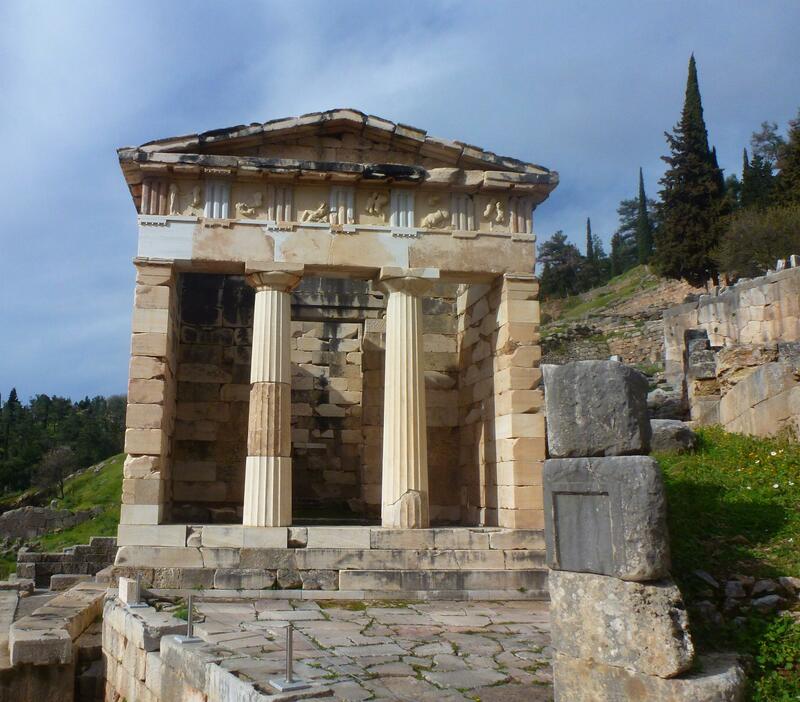 The ancient bit refers to a town from 400 BC with an estimated 90,000 inhabitants, which is reasonably new as they believe the area has been occupied by man since 6500 BC. During the war of independence the Turks pretty much destroyed the ancient town and then in 1858 an earthquake finished the job off and lead to the new town being built. The excavations site is pretty much in the centre of the current village, probably the size of several football pitches it sits within the modern day village with just a wire fence around it. You can pay to enter or, as we did, you can walk right around the perimeter on the public roads. We chose the free option purely due to being a bit tight, it probably was more than worth the €6 each but when the option of a freebie presents itself we couldn’t resist. As with all the ruin sites one temple was partially rebuilt (perfect for photo opportunities), in this case it was the Temple of Apollo. Even from the fence the whole thing was quite impressive, the buildings have some depth to them, in some case even the arches of window frames and its much easier to see the city outline than at other sites were its been piles of rocks that you have to picture as buildings. Even better its seems they are discovering more of Ancient Korinth by the day, on the outskirts of the village there are ruins a plenty, not sure how big this place was but its going to be a few hundred more years before they find and uncover it all. 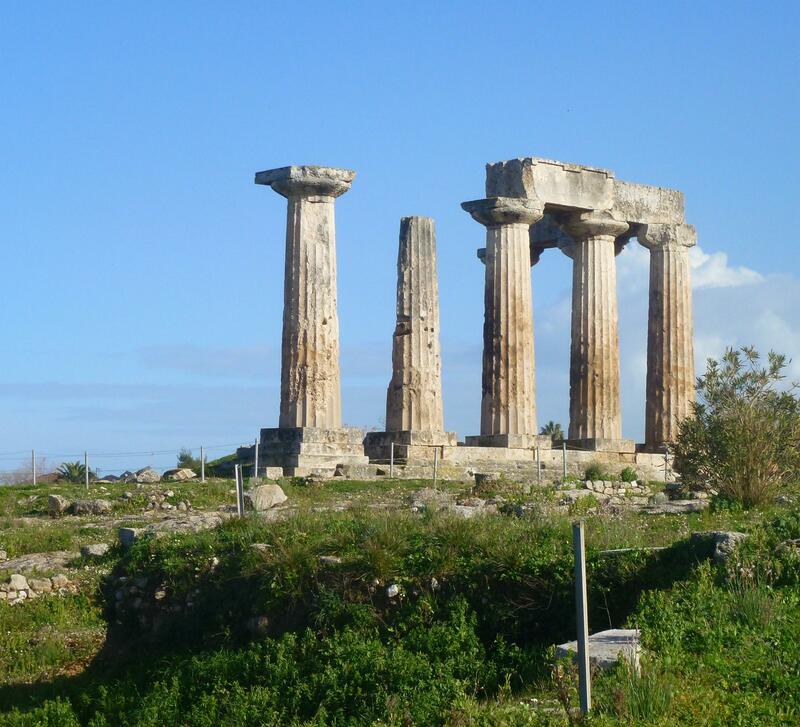 As one of the greatest cities of Ancient Greece we were more than impressed, it seems that even when you think you have had a total fill of ruins the Greeks have something a bit more special to entice you in to another one. Alongside the ruins there is a good little cottage industry of shops and cafes, even on a wet and grey day the coach loads were arriving and everywhere was open for business. 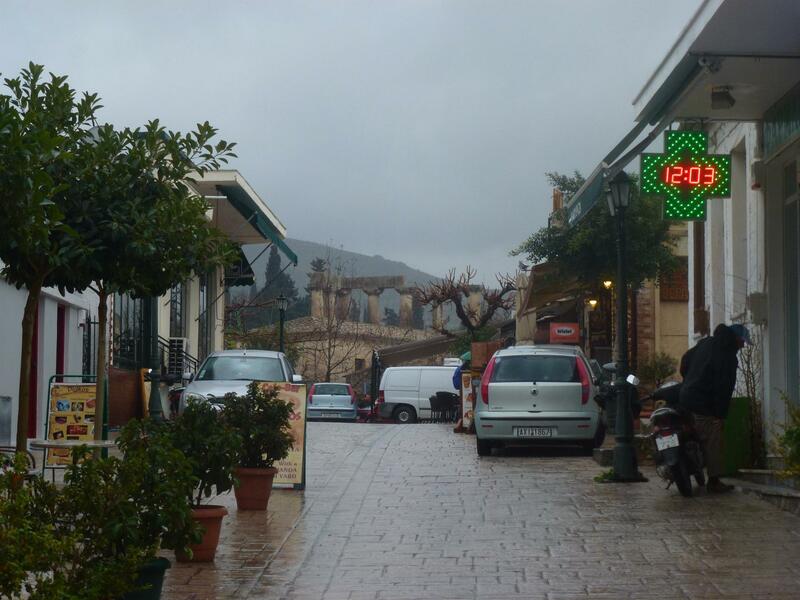 The tourist area of the village was pedestrianised with tavernas and souvenir shops each side and the Temple of Apollo at the end. The weather wasn’t at its best and we didn’t do the visit justice in terms of going in, yet would still give this place a big thumbs up and say its well worth visiting, especially if you are staying at Afrodites Waters. We stopped off for a coffee and ordered a couple of slices of toast for Iain – we received a toasted ham and cheese sandwich each! Not totally sure they don’t understand what we want, I think there may be a ruse going on as you get what they want you to have and you happily pay for it. At €8 (£5.80) for two lattes, two toasties and a few crisps it was quite a bargain and it kept us out of the rain for half an hour. From there it was time to embrace the souvenir shops and hunt out a couple of magnets for the collection. In general Greece isn’t cheap for some stuff but on the tourist tatt its not bad at all – €1.50 for a magnet here vs €6 at Pont De Gard, bargain. 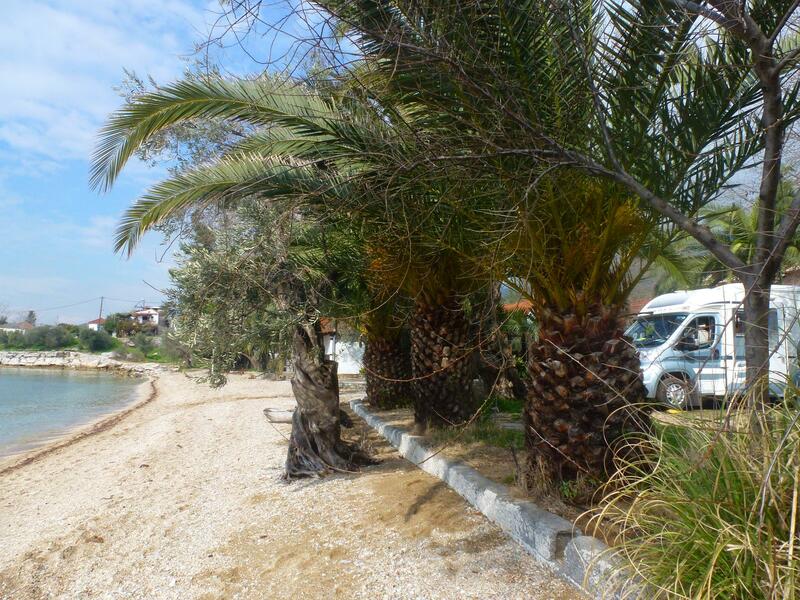 We have both very much loved Campsterop Afrodites Waters, very different to anywhere we have stayed in Greece. The toilets are air conditioned, well I think that is why there was a hole in the roof anyway :). The mini market is just the best ever, 3 bottles of home-made olive oil, 4 jars of home-brew olives and some jam – what more could you need. 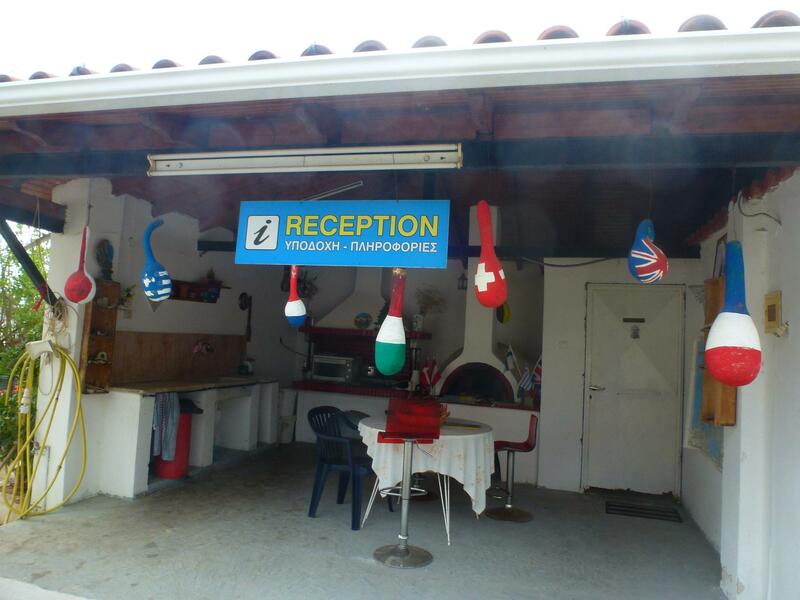 The reception area has a BBQ grill, hot plates for cooking and a table and chairs if you want to eat there. If the Greeks need to make some money out of the tourists they could do a whole lot worse than have a string of these cheap and cheerful motor-home stop off points, no fuss, no hassle, just ace for a couple of days stop. The Camperstop advertises being just 100 metres from the ‘hidden and forgotton spring of Afrodites’ godess of beauty. At first we thought it was very well hidden as we couldn’t find it. Possibly well forgotten too as even the guide at the ruins didn’t have any idea where it was. Then I noticed a sign on site, followed a rough path up the side of the hill and hey presto it appeared I had found the spring. A craggy rock face with water dripping, the first part did look like it might be part of the mains system (the pipes visible in the mud gave it away) but the second, larger set of rocks were for my money the original springs of Afrodites, as advertised. I have therefore anointed myself quite liberally with the said spring water and should I not resemble a Super-Model by Thursday I will be returning for a full refund! Our main reason for stopping off here was more for the canal that the ruins. 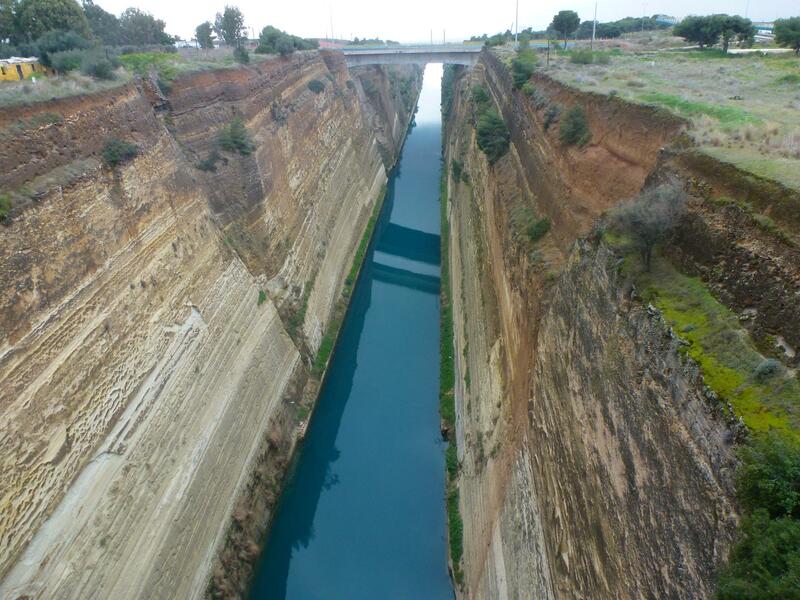 The Corinth canal connects the Gulf of Corinth with the Saronic Gulf in the Aegean sea, being the bit along the top of the Peloponnese. 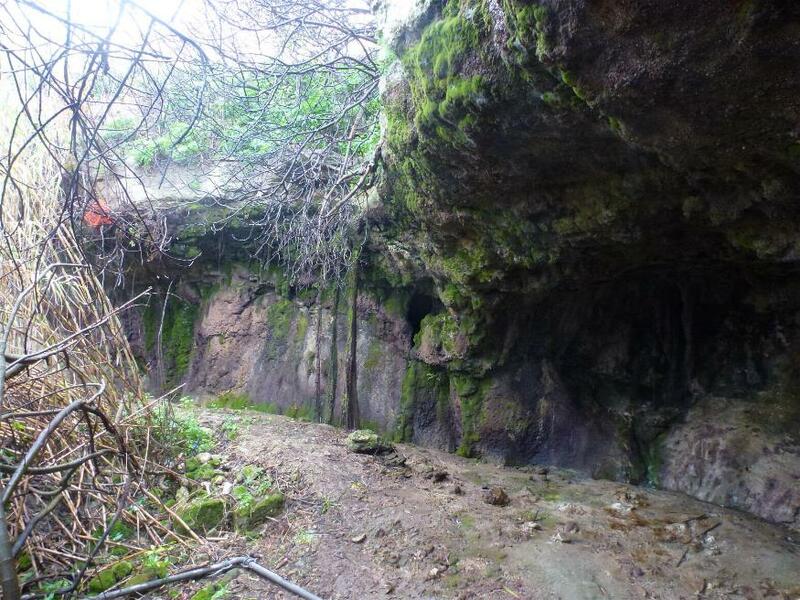 Our first challenge was finding it, we found the top end fairly easily but there was a 3 tonnes weigh restriction on the bridge, we could see down the canal but the bit we wanted was a mile or so along – looking down where it was carved through the rock. We went down to the other end and hey presto there was another 3 tonne weight restriction. By now we were both getting slightly fed up with the idea of the canal – yes we have a map but the bit where the road crosses the canal has writing over it – we agreed to take the main road over and if we couldn’t find it give up. Turn right, 1/4 of a mile up the road one canal, at last. Once you find it you wonder how you could of missed it in the first place, well I think that was what Iain was trying to say when he queried why it had taken me several attempts to get us there. Was it worth it? for us a massive yes. Slightly disappointed there wasn’t a cycle path along side :), we were looking forward to adding it to our lists of canals cycled, but other than that its an incredible sight. 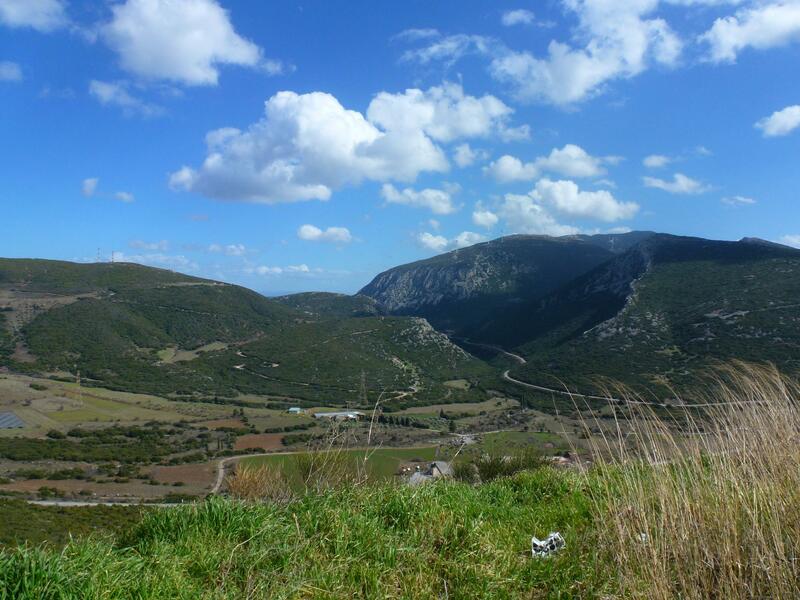 It is a 70 ft wide cut through the land at the Isthmus of Corinth, and makes the Peloponnese effectively an island. The canal is 4 miles long and it’s very, very deep, built at sea level so it doesn’t require any locks. It was never really a great success, when it opened it suffered rock slides which were a major deterrent to users, nowadays the width of only 70 ft makes it impassable for most modern ships. As a tourist attraction it does it’s job and would probably do even better with some decent flipping road signs to it. 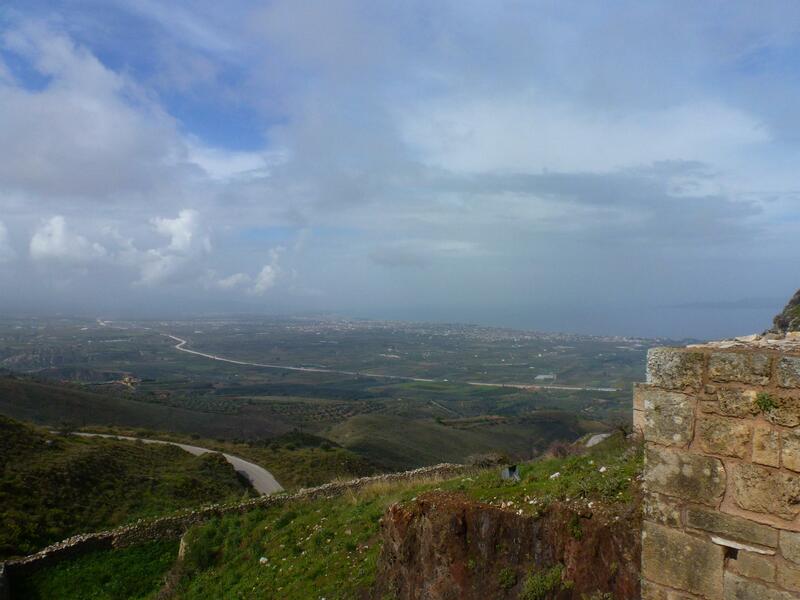 Since we had arrived here we kept looking up to Akrokorinthos way up on the hill, 1800 ft above sea level. Being 4 km up hill we weren’t going to walk it, but the sun came out on the way back from the canal so we thought we would pop up for a look. Basically a monolithic rock with a whacking great castle perched on the top. It’s the home of the God of the Sun, probably as its one of the closest building in Greece to the sun. I suffer from a fear of heights, it was high and I suffered. The pain eased when it was free to enter, but the even though the rain has stopped the stone paths were very slippy and this didn’t help me calm my irrational fears. We walked / skidded up through the first two gates, the path went right to the top but I decided that was a destination we didn’t need to achieve. 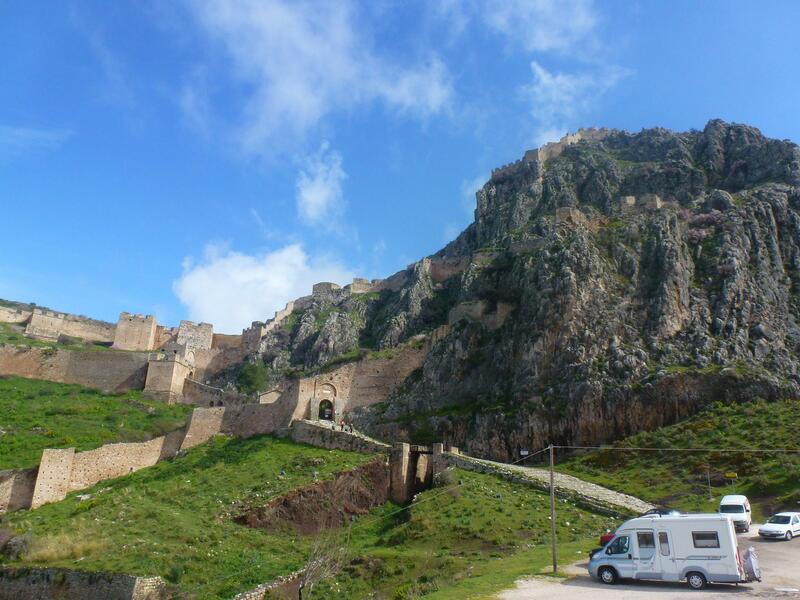 According to the tourist blurb it is “the most impressive acropolis in mainland Greece”, whilst we haven’t seen enough acropolis to be experts we did think it would be difficult to better this one. From the road looking up it seems to cover a fair sized area, it’s only as you start to climb the pathways and go through each gate you see the area is much larger than it at first appears. Not sure we did it justice, well we didn’t as they say it takes 3-4 hours to walk around everything and we were less than an hour. For the views alone its worth the drive up there, I cannot help keep promoting Greek tourist must sees – they really are so impressive you must see them if you can.